"Amphidrome" redirects here. For the former stadium in Houghton, Michigan, see Dee Stadium. An amphidromic point, also called a tidal node, is a geographical location which has zero tidal amplitude for one harmonic constituent of the tide. The tidal range (the peak-to-peak amplitude, or height difference between high tide and low tide) for that harmonic constituent increases with distance from this point. The term amphidromic point derives from the Greek words amphi (around) and dromos (running), referring to the rotary tides running around them. The M2 tidal constituent, the amplitude indicated by color. The white lines are cotidal lines spaced at phase intervals of 30° (a bit over 1 hr). The amphidromic points are the dark blue areas where the lines come together. Amphidromic system of the M2 constituent in the North Sea. The light-blue lines are lines of equal tidal phase for the vertical tide (surface elevation) along such a line, and the amphidromic points are denoted by 1, 2 and 3. 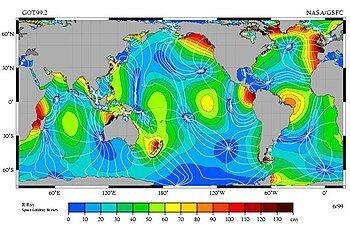 Amphidromic points occur because the Coriolis effect and interference within oceanic basins, seas and bays creates a wave pattern — called an amphidromic system — which rotates around the amphidromic point. At the amphidromic points of the dominant tidal constituent, there is almost no vertical movement from tidal action. There can be tidal currents since the water levels on either side of the amphidromic point are not the same. A separate amphidromic system is created by each periodic tidal component. In most locations the "principal lunar semi-diurnal", known as M2, is the largest tidal constituent, with an amplitude of roughly half of the full tidal range. Having cotidal points means they reach high tide at the same time and low tide at the same time. In the accompanying figure, the low tide lags or leads by 1 hr 2 min from its neighboring lines. Where the lines meet are amphidromes, and the tide rotates around them; for example, along the Chilean coast, and from southern Mexico to Peru, the tide propagates southward, while from Baja California to Alaska the tide propagates northward. The islands of Madagascar and New Zealand are amphidromic points in the sense that the tide goes around them (counterclockwise in both cases) in about 12 and a half hours, but the amplitude of the tides on their coasts is in some places large. ^ Desplanque, Con; Mossman, David J. (1 January 2004). "Tides and their seminal impact on the geology, geography, history, and socio-economics of the Bay of Fundy, eastern Canada". Atlantic Geology. 40 (1). doi:10.4138/729. ^ a b "Tides in two easy pieces - Earth 540: Essentials of Oceanography for Educators". Retrieved 21 July 2016. ^ Cartwright, David Edgar (2000). Tides: A Scientific History. Cambridge University Press. p. 243. ISBN 978-0-521-79746-7. ^ "Untitled Document". Retrieved 21 July 2016.